Face it. We’re not in a shooting war, but we are most certainly in a civil war. One of the ways you can tell is that when a terrorist incident happens on the other side of the planet, involving ZERO Americans in any way, vile American progressives immediately try to place blame on..THEIR FELLOW AMERICANS. 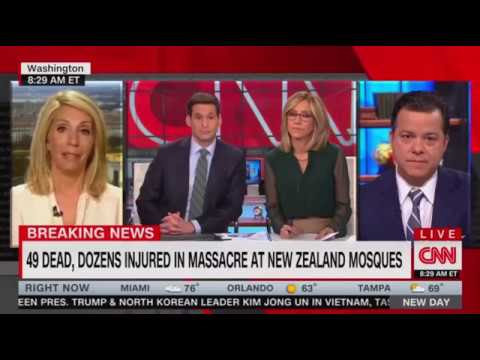 Hosts John Berman and Alisyn Camerota began the segment lamenting that the shooter’s alleged manifesto, which was posted online, contained rhetoric that was similar to things President Trump has said in rallies and ads. THIS from a group of people who just last week couldn’t muster the testicular fortitude to condemn Rep Ilhan “Mullah” Omar by name for her words of blatant hatred and ignorance. It’s even worse on social media. Yet – when a muslim kills a christian, or a homosexual, or a jew, that’s not anyone’s fault but the perpetrator? Or when a progressive shoots up a baseball diamond filled with Republican Congressmen, that’s not the fault of the media and Democrats for whipping him up? Or when ANTIFA beats people in the streets of cities across the country, and that seems to be the fault of nobody, or maybe even Trump supporters somehow? Yes. We’re at war. It’s a cold civil war.